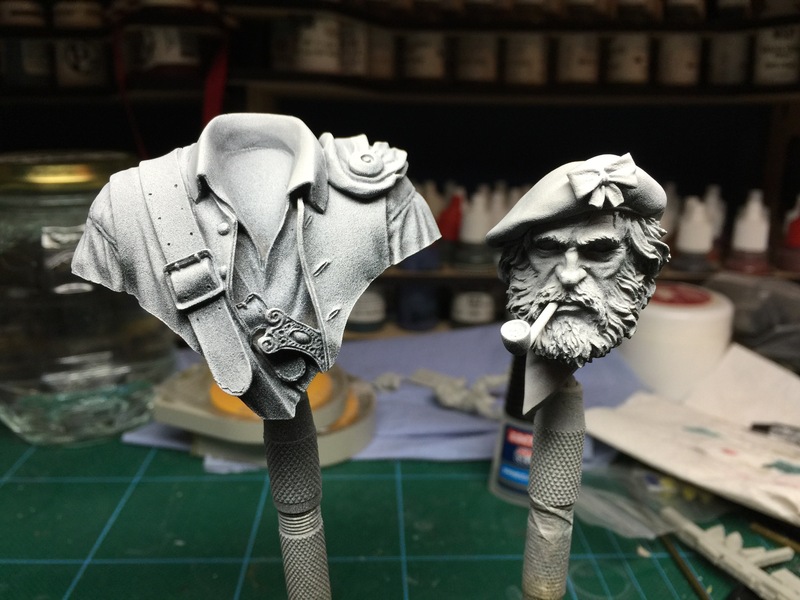 So I settled down to watch my Kirill video and try my hand at painting in his style… Here is my experience..
Let’s start at the very beginning (which, as they say is a very good place to start*) and as is to be expected, I started with the primer. This isn’t really covered in the video but I could see that the bus was primed in the zenithal method of laying down black first and then when that is dry priming again with white from above. This gives natural highlights and shadows that can be used to guide your eye later on in the painting process and give a decent idea where the shadows and highlights should go. I also watched the video(s) a couple of times. This was really important so that I had an understanding of the direction the face was headed. During the vids, I realised that I had seen this sort of technique before, back in the early naughties and I am sure it was called ‘Tweening’ because you paint the colours between to create your blends. I’d never tried it before this weekend though. It’s not algebra it’s art, and you can choose any colours for your taste. So, my thoughts on the video… It was really very well put together and Kirill explains what he is doing in a straight forward and useful way. The technique itself is presented well and in enough detail to try and replicate the style. It is, however, going to be one of those methods that require a lot of practise to get close to the quality seen in the videos, so don’t be disheartened and keep trying. My only negative is that there are a couple of stages missing in the tutorial which is a pity as one of those is the beautifully textured shirt he is wearing which really brings out the weave. I will be trying my hand at producing something similar but it would have been nice to see how the master does it. I must admit, I am pretty pleased with the results, especially after I sketched the initial light and dark in his beard, it seemed to really come together. 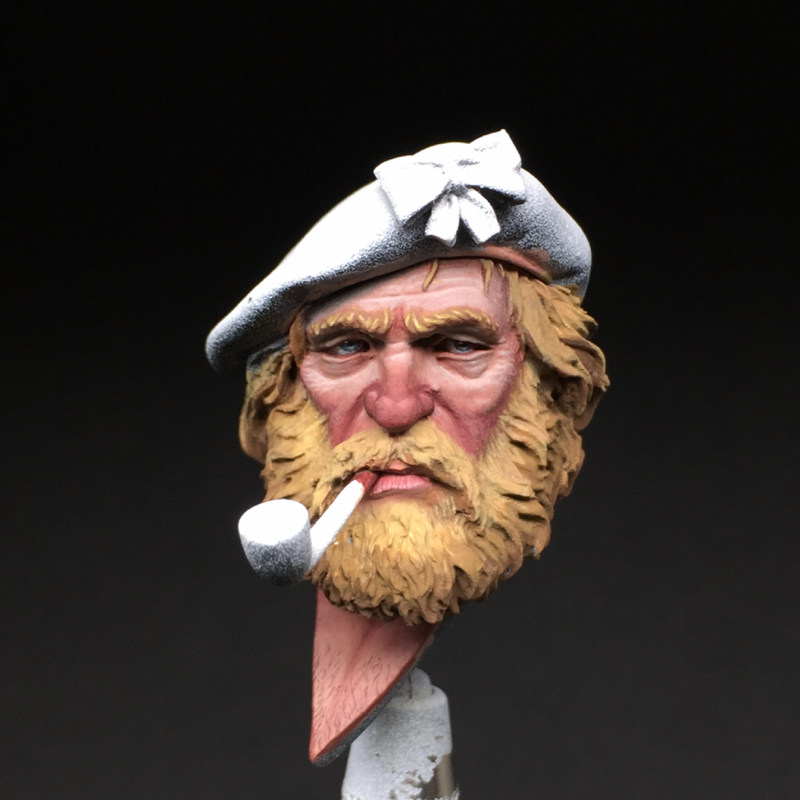 One thing that doesn’t show in these photos is how dark his nose has become – I am going to go back in there with a bit more of the mid tone to knock it back before I continue with the rest of the bust. All in all a brilliant video again with a technique quite different to the previous Painting Buddha video I tried, and with a very different result, but just as much fun in getting there. Highly recommended for anyone who wants to paint realistic textures on larger scale miniatures. *Sound of Music anyone? ok… Just me….